During the past year, SWM program staff conducted a meeting with 10 home compost program participants and 3 training courses on home composting with 30 community members (24 women and 6 men) and 3 training courses on home garden with 27 community members (21 women and 6 men). Two training courses were conducted on using coconut shredding equipment and using the toy truck to lift waste containers for six SHG members (3 women and 3 men). » Community Waste Management Committee in Samaky community, made up of local residents, continued to be responsible for managing the work of waste collection with support from CSARO staff. » Self-Help Groups member in the centre were more active in their participation to produce compost and understood more about making and using compost material. » Self-Help Groups in Samaky understood more about waste separation skills. 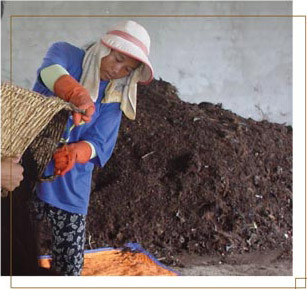 » 20 Residents in Sen Sok community practiced using compost and home gardening on their own land. My name is Tim Channy. I am 35 years old. I am from Sen Sok village. I have three children (one girl and two boys) and my husband is a handicap person. We are one of the families evicted from the Bouding slum area in 2000. I have been composting solid waste for four years, to earn my living. I am member of the Self-Help group of three person formed to do solid waste compositing. We do composting at CSARO demonstration center and receive constant training and marketing support from CSARO staff. One of our team members is a driver and the other two of us collect organic solid waste like vegetables and coconut husks from the market and convert it into compost. Currently we have 12 compost containers. On average 3 to 4 containers (1000kg each) of compost is produced and sold in the market per month when we have full production. I earn US$ 60 per month from selling compost. This work has boosted my confidence to support my family and increased my self-esteem because I produce a useful product that people want. My income is supporting my family expenses and now all my children can go to school, have clothes, etc. I am respected by my husband and neighbors too because I earn for my family income. I do not have TV or radio at my home as income is just enough to support our daily living. I did have a plan to start compositing at my house too, but I have very small land, no capital to buy composting machine and am afraid to borrow from the bank because not sure of the success of the business.